For the last two decades, historic sites around the country have been engaged in a steady, thoughtful discussion about slavery and race. This conversation isn’t always comfortable or easy, but it happens consistently and it happens with the authenticity and veracity that can only happen in an old place, in a place where history happened and history is preserved, and history is connected to the present. This year the Preservation Leadership Forum blog takes a look at National Trust Historic Sites and how their interpretation of slavery has evolved and changed over the years. The full series is available here. In 1846 Hannah Townsend, a member of the Philadelphia Female Anti-Slavery Society, published the Anti-Slavery Alphabet, a pamphlet written to explain the horrors of slavery to children. Townsend and other members of the Society understood that, if they could reach children with messages like “K is the Kidnapper, who stole That little child and mother—Shrieking, it clung around her, but He tore them from each other,” they would have an opportunity to create a new generation of abolitionists whose opposition to slavery would spread to their playmates and parents, creating lasting change. As one journalist recently wrote, this pamphlet was “not subtle or nuanced.” It plainly and unapologetically depicted the physical violence inflicted by enslavers, the agency of the enslaved, and the complicities of those who fueled the system. But it also provided children a vocabulary with which to discuss these horrors at ages significant to the development of their identity and world view. Historic sites have long grappled with how to interpret slavery to children and families. In the past year alone, I’ve participated in no fewer than five separate discussions on this topic with colleagues at other historic sites. Too often programs on slavery aimed at reaching families and children revolve around the cultural vestiges—foodways, storytelling and oral histories, crafts, and so on—of enslaved people. While these are important aspects of the story, a critical theme is largely absent from such narratives: the fact that these traditions functioned as coping mechanisms during moments stolen from the painful grip of a system that denied enslaved people their most basic human rights. Such interpretation leads to cringe-worthy comments from relieved parents, like: “See, slavery wasn’t that bad” and “So-and-so must have been a good master to give them all that time to grow their own food.” It’s as if somewhere in the years between 1846 and 2016, the field decided that it’s okay to “play act” slavery, rather than provide meaningful opportunities for children to grapple with it. Or perhaps we just don’t know what to say. While it may be difficult to imagine using graphic, rhyming verses like those found in Townsend’s alphabet to explain slavery to children today, it is imperative that we find appropriate ways to educate the next generation of human rights defenders about the struggles of the past and present. With the right approach and thoughtful dialogue, this knowledge will not only aid children in developing an understanding of our history but also arm them with the language they need to become conscientious citizens of the world and stalwart human rights advocates. At President Lincoln’s Cottage, we decided that interpreting slavery is a vital responsibility, and our training and education programs reflect that choice. Slavery interpretation is important for moral development. Children are emerging as moral thinkers learning to distinguish between right and wrong. They are initially self-interested, and their understanding of right and wrong relates to how a specific situation impacts them. As they mature, they begin to develop a concern for others, and they need to experience perspectives different from their own to elevate their moral development. For middle and high schoolers, questioning social conventions and evolving their own decision-making skills is an important part of that development. Historic sites have unique opportunities to interpret slavery—and other injustices—to support the development of our young visitors. For our elementary school–age visitors, the Cottage has taken a conceptual approach to talking about slavery by setting it within the context of Lincoln’s ideas about ending it. Guides at the cottage have found that questions like “How would you feel if you could not be with your family every day?” and “What should you do when you see something that is wrong?” are particularly effective in getting younger students to discuss moral dilemmas. 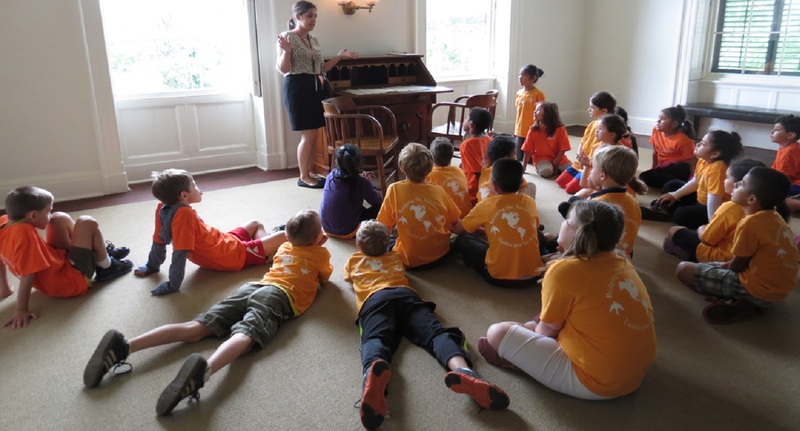 In Lincoln’s Hat, our education program for grades K–3, guides often begin by asking students to describe what they know about slavery, which allows the students to set the boundaries for discussion. In simplest terms, they identify that slavery is wrong and that action taken to end slavery is right. While they may not quite grasp all the nuance of Lincoln’s actions, they understand the Emancipation Proclamation as one significant step against the institution of slavery. Middle school students develop their own decisionmaking skills by examining the discussions about emancipation that Lincoln had with his advisers. | Courtesy of President Lincoln’s Cottage. To further aid the growth of elementary school–age students with a developed sense of concern for others, programs at the cottage provide an opportunity to consider varied perspectives in real-world scenarios. In I See the President, our program for grades 4–5, students discover the agency of the numerous self-emancipated men, women, and children who took freedom into their own hands and, despite the many risks, fled slavery. By exploring primary resources, students learn that these brave actions had a profound impact on President Lincoln, prompting his support of emancipation. Through facilitated dialogue students realize that everyone needs to recognize and take action against injustice, regardless of whether it directly impacts them. As in Lincoln’s Hat, guides often begin these discussions by asking students to define slavery. Frequently students’ answers are based on their own life experiences and describe, rather than defining, slavery. For example, some students describe slavery in terms of not being paid for one’s work, while others describe it as being separated from one’s family. On the surface those may seem like different answers, but guides help students tease out their shared, underlying understanding that slavery is the worst condition they can possibly imagine and, at its core, is the devaluing of human life. Debating Emancipation, our education program for middle and high schoolers, uses Lincoln’s heated discussions about emancipation with his cabinet as a model to develop students’ decision-making skills and build their support for positive social change. In this program facilitators introduce students to multiple perspectives on slavery and emancipation, encouraging them to examine the motivations of various stakeholders. Students learn that while Lincoln was, and still is, criticized for not doing enough to end slavery, he was forced to navigate a variety of opinions to do what he believed was within his limited power as president. This type of consideration is vital to adolescent development, as teens are forming a strong sense of self. Feeling motivated by their own power and influence, adolescents begin to question social conventions and challenge the status quo, as Lincoln did. I often share a quote from Patrick Henry with this age group in which Henry admitted to believing that slavery was wrong but was “drawn along by the general inconvenience of living without them [slaves].” Students are often incredulous that it was socially acceptable for someone to believe one thing and practice another and do not attempt to justify this hypocrisy, in contrast to most of my experiences sharing this same quote with adults. Presenting slavery in evolving, age-appropriate narratives can help frame student development, using history to set a moral compass that will serve them when they confront injustice in the present day. In Part II of this series, I will detail the contemporary situations that programming at the Cottage explores as both examples of present-day injustice and opportunities for students to take a moral stand in defense of human rights. Callie Hawkins is the associate director for programs at President Lincoln’s Cottage.